Wednesday through Saturday, 6 p.m. to midnight; Sunday, 10 a.m. to 2 p.m. When you think "bakery," perching on a bar stool until midnight isn't what immediately comes to mind. But Caramel Bakery and Bar, which opened on Park Avenue in October, is a cheerful, sweet-smelling alternative to many of the city's nighttime haunts. Wednesday through Saturday it's a great after-dinner spot for dessert and a nightcap or two, and its Sunday brunch is providing a welcome option for those tired of the long wait for a seat at the other Park Avenue eateries. Haley Shuman and Mark Mendola opened Caramel with a fall menu, but they've shifted to a winter menu featuring seasonally-available fruits, such as berries, sourced mainly from the Rochester Public Market. You can order items like French macarons from the pastry case in the front of the shop, or take a seat and linger over a decadent dessert and coffee, beer, wine, or a cocktail. A Webster native, Shuman attended Pennsylvania College of Technology for baking and pastry arts. For a college project she designed a restaurant called Halo's Dessert Bar, which resembled what Caramel is today. "We kind of always had it on the back burner," Shuman says. After college she moved back to Rochester, where she was the assistant pastry chef at the Rochester Riverside Convention Center and then the bakery manager at Hegedorn's. After a while she just wanted to work for herself, she says. Mendola, who bartends and manages the front-of-house operations, is a woodworker and created most of Caramel's furniture, including the bar top, shelving, tables, and bench seating. Between the handmade furniture, the deep cerulean-painted walls, potted plants and fresh flowers, the spot has an eclectic, cozy vibe to it. And though the raw wood and pipes are there, the shop isn't anything like the bare bones, industrial aesthetic that has become so pervasive with cocktail bars and third-wave coffee shops. Shuman says she was inspired by the open-late, old-world bakeries she's visited while on vacation in other cities here and abroad, in Switzerland in particular. "There was this beautiful little Swiss bakery that was open late that had coffee and cocktails," she says. She wanted to re-create that feeling of a late-night community spot in her own shop. 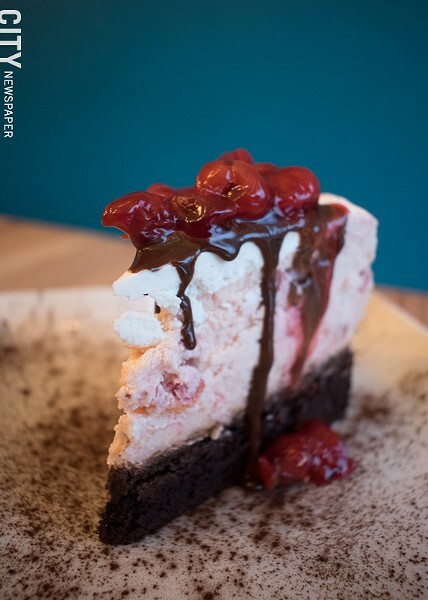 Caramel Bakery and Bar's Forbidden Forest layers chocolate cake with cherry cheesecake. "One of the things that makes me so happy is when I come out and see people hanging out, like after they're eating, or playing one of the board games we have out there," Shuman says. "I just love that people are comfortable enough to come in and just relax." Caramel's menu has limited gluten free options and includes vegan sweet potato chips and vegan donut holes, which come with chocolate, raspberry, and caramel dipping sauces. All of the desserts are $10, and Shuman and Mendola have fun naming them (note the hat tip to Rihanna with the "Under my Nutella-ella-ella-eh"). "I love making plated desserts, that's my favorite part of it," Shuman says. "I love it when we get to bring out a dessert and see people's faces so excited that there's this extravagant dessert coming to them," she says. I tried the Forbidden Forest, which is Caramel's take on a Black Forest cake. It features a thin layer of chocolate cake with a cherry cheesecake top, and is surprisingly light for such a rich, dense-looking slice. There's a pairing menu, with each of the desserts matched with a craft beer (add $5), a wine (add $8), or a cocktail (add $7). Per the pairing suggestion, I ordered the Winter Paloma, a warming, fruity take on the tequila-based beverage featuring muddled blackberries, and cranberry and pomegranate juices. 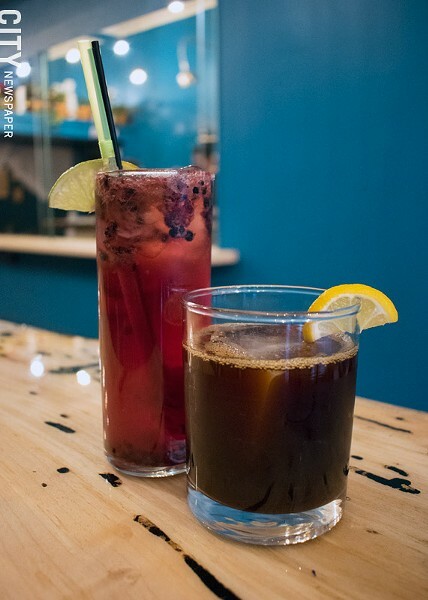 The Winter Paloma and an Old Fashioned with a shot of espresso. Shuman says one of her favorite pairings is the refreshing Gin n' Juice cocktail and the Uh-Huh-Honey, which I'd definitely order again. It's a warm and gooey pomegranate, orange, and apple crisp over a perfect pie crust topped with honey ice cream, which only gets better as the dollop melts into the crisp. Much of the brunch menu is "influenced by what Mark and I like to eat at diners," Shuman says. "And then we just upscaled it slightly." A popular brunch item that Shuman says sells out almost every week is the Dola's Delight ($8), which is influenced by Mendola's love of combining Sriracha and pesto. The dish features both those condiments with eggs and bacon over cheesy, crispy hash browns that are cooked in a waffle iron. Shuman and Mendola say they plan to add outdoor seating in the coming summer, and they are considering adding Saturday brunch hours in the near future.